Will fit: waist 15.75"(40cm) to 39.37"(100cm) ; Leg 11.81"(30cm) to 25.59"(65cm),Designed for children 4-12 years old. Weight 700g.Maximum Breaking Strength: 23KN. About 5000 lb rated webbing. Sandwich waist and legs design.Children's Climbing Harness Ultra Light, traditional buckle, harness construction distributes pressure to keep you comfortable while climbing.Waist belt and leg loop are lined with breathable mesh to ensure comfort in warm temperatures. 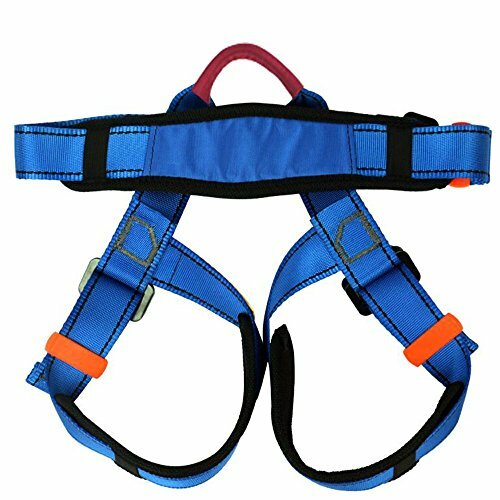 Perfecting for Young Kids Indoor Caving Rock Climbing Rappelling Equip,Outdoor Outward Band Expanding Training,Mountaineering,Working on the higher level and ect.